The people involved ate 67g of nuts a day on average, over a period of three to eight weeks. As well as improving cholesterol levels, it also reduced the amount of triglyceride, a type of blood fat that has been linked to heart disease. However, the impact was least pronounced among the overweight. It is not yet clear why nuts have this effect, although one suggestion is that it is down to the plant sterols they contain, which are thought to interfere with cholesterol absorption. 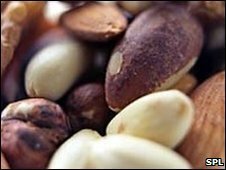 Lead researcher Joan Sabate said increasing nut consumption as part of a healthy diet should be recommended. He added: "The effects of nut consumption were dose related, and different types of nuts had similar effects." Ellen Mason, senior cardiac nurse at the British Heart Foundation, agreed, but she urged people to go for unsalted nuts. "Apart from salted peanuts at the pub, nuts in sugary cereals or the traditional Christmas selection, nuts have been largely lacking in our diets in the UK," she added. The study was carried out by independent researchers, although it was partly funded by the International Tree Nut Council Nutrition Research and Education Foundation.